This article explains how to export your prototype project as an iDoc and how to import it to a Definition Center or Studio. An iDoc is a self-contained file of an iRise project, used to email projects to stakeholders who do not have access to a Definition Center. It can also be used to take an offline backup of a project. Stakeholders who are not otherwise iRise users will need to download the free iRise Reader in order to open and use an iDoc. iDoc is short for 'Interactive Document'. You will need to be an Author on the Definition Center in order to perform this task. Click on the Projects tab, then ensure you have either the root or a folder selected. Select the checkbox next to the project you want to export, then click More Actions button. From the drop down list, click on Export to iDoc. A file called <project_name>.idoc will be downloaded automatically. If you wish to export an iDoc that is password-protected, select the Export Protected iDoc option and you'll be prompted to enter a password for the iDoc. With the project open in Editor, click on the down arrow next to the project name > Download. A file called <project_name>.idoc will be downloaded automatically. With the project open in Studio, click on File > Export > to iDoc. At the 'Save As ...' prompt, browse to the folder location you wish to save the file (default is your home directory) and specify a filename for the iDoc. An .idoc file extension will be automatically applied. Importing an iDoc can be done either via the Definition Center or via Studio. Click on the Projects tab and ensure that either the Definition Center root folder or a sub-folder is selected (highlighted in blue) under the 'All Folders' section. 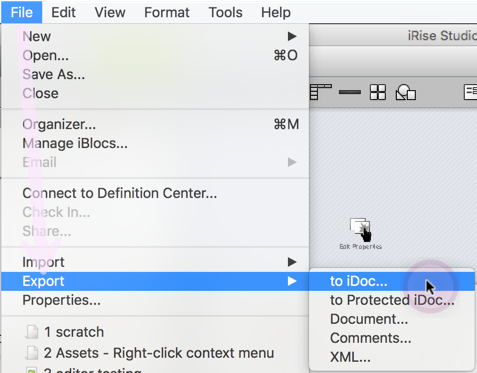 Click on the More Actions drop-down button and select Import iDoc. Browse to the folder where the iDoc is located and select the file. In the Import As box, give the project any name that you wish to use. There are a couple of options for importing an iDoc into Studio. You can either 1). import the entire iDoc as a complete project or 2). import selective chapter(s)/folder(s) from an iDoc into an existing project. 1. Import the iDoc as a new project Without a project loaded, click on File > New > Project from iDoc and navigate to the location of your iDoc file. 2. Import an iDoc into a current project With a project loaded, click on File > Import > From an iDoc and navigate to your iDoc file. 3. You'll be presented with an option to either import all chapters/folders or select individual chapters/folders to import. All separate sub-folder containing the imported items will be generated, keeping it separate from the contents of your current project. 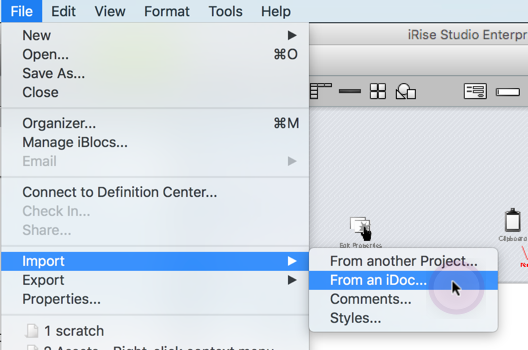 You can import an iDoc from an older version of iRise into a newer version, but you cannot import a newer iDoc into an older version. If you have any problems importing or exporting projects, contact Support and we'll be glad to assist.